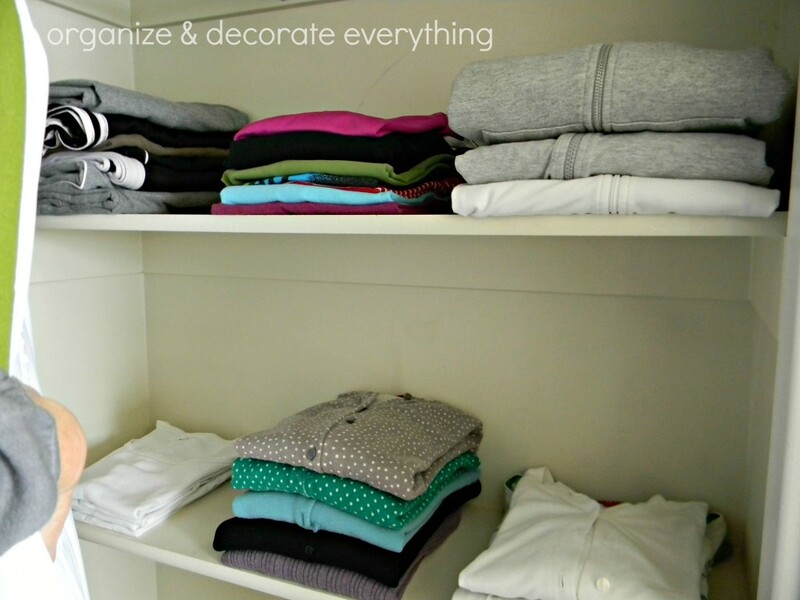 Whether you have a large walk-in closet or a tiny closet, these tips can help you get your closet clean and organized and keep it that way. If you’ve never cleaned out your closet before (or it’s been a long time) start by emptying the whole thing to get a fresh start. While it’s empty take a damp cloth and wash down the rods, shelves, walls, and baseboards. Don’t forget to vacuum too. 1- When was the last time I wore this? If it’s been more than a year it’s time to get rid of it. 2- Does it fit? Don’t hang onto things that are too small or too large. 4- Would I buy it right now? If you wouldn’t, you probably never wear it. 5- Do I like the way I look in it? Again, you’re probably not wearing it if you don’t. As you’re putting things back group “like with like”: dresses, skirts, pants, sweaters, long sleeve shirts, short sleeve shirts, etc. I also like to group by color. It makes it easier to find what I want to wear and make outfits quickly. Don’t return things back to the closet that don’t belong there. 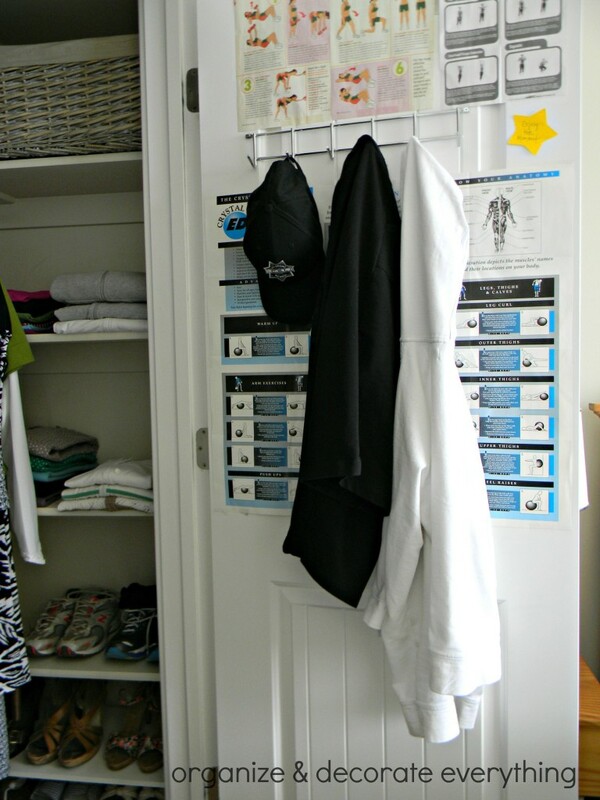 I like to store my exercise clothes, jackets, sweaters and tanks on shelves. If you don’t have shelves in your closet you can hang a portable hanging shelf unit from the rod. You could also add some stacking portable shelves if you have the floor space. I also use portable shelves for shoes. It keeps them off the floor and easy to see. 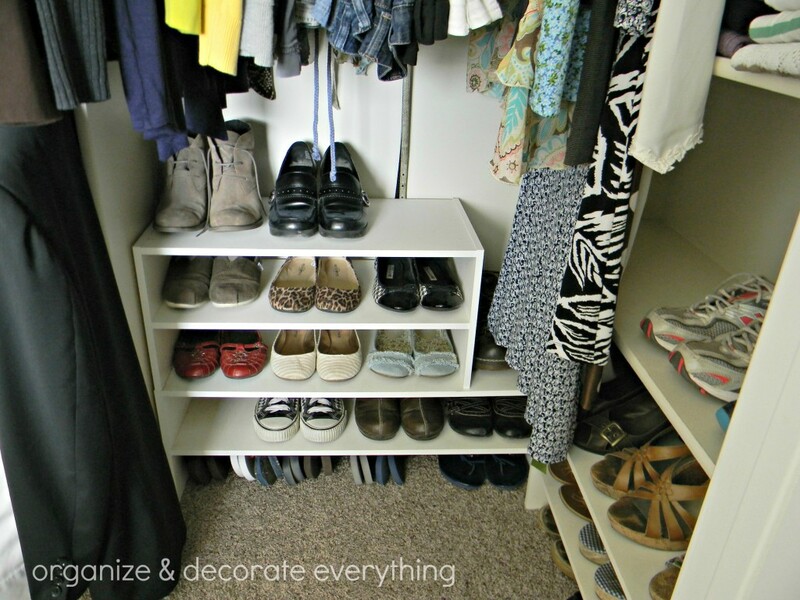 Try to use all available space but keep as much off the floor as possible. I’ve placed the shelves under the hanging clothes and under the shelves on the right side of the closet. Store your bags out of the way but also easy to get to if you change often. If you have space to hang your bags that’s also a good option. My bags are stuffed with paper to help them keep their shape. 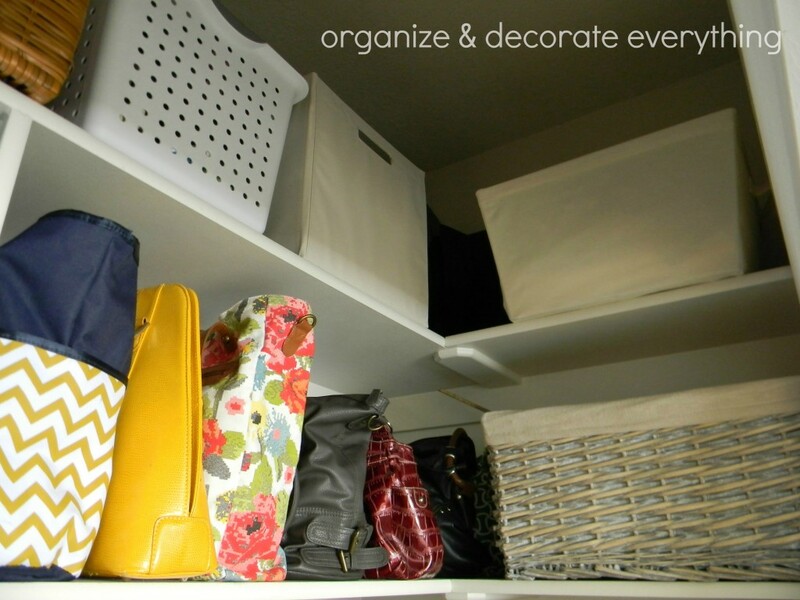 Use baskets or bins to hold smaller objects to keep them corralled. It would be nice and pretty if containers matched perfectly but I use what I have. 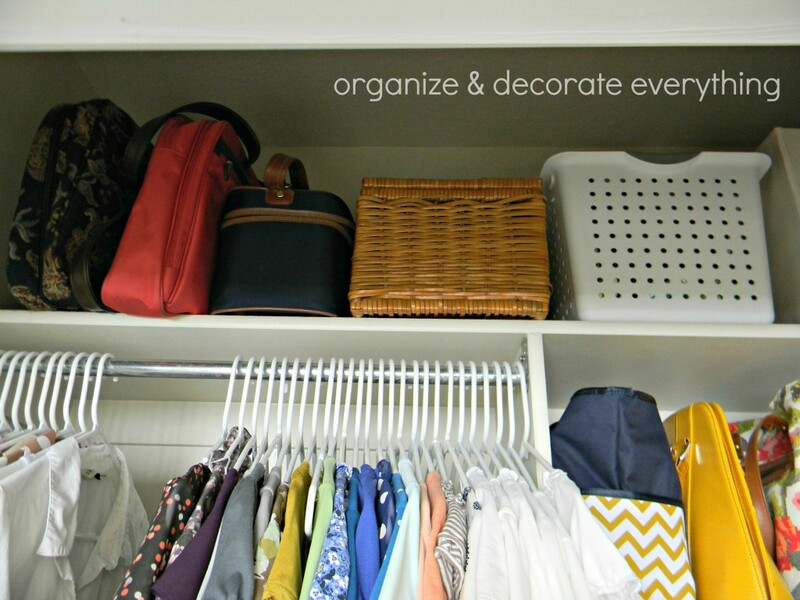 You don’t have to spend money to be organized. Store seldom used items on the very top shelf. The bags and baskets can also hold smaller, little used items. Use tags labeled with what’s inside if you can’t remember. Keep a fold-up stool in your closet to reach the high shelves. There’s usually space on the inside walls of a closet no matter how small. 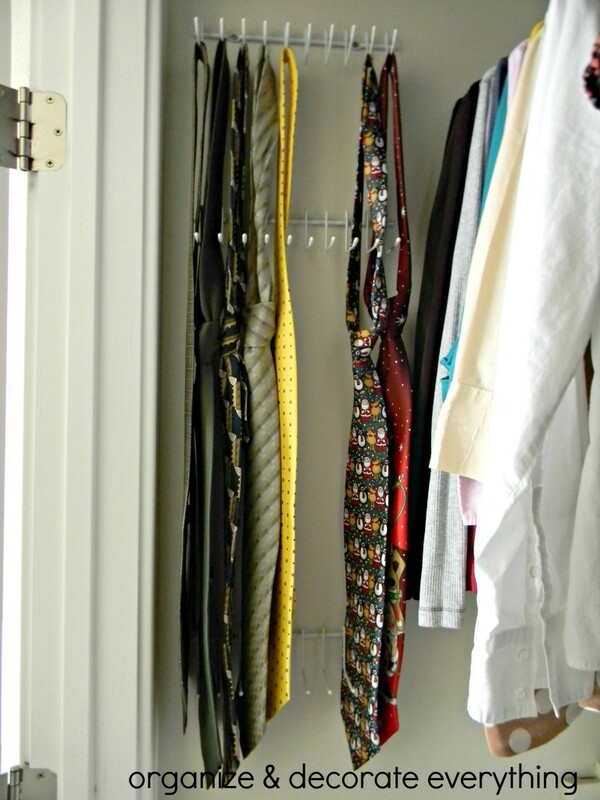 Utilize that space by hanging hooks to store ties, belts, bags, scarves, etc. They’ll be kept neat and tidy and you’ll have easy access to them. Don’t forget the inside of the doors. 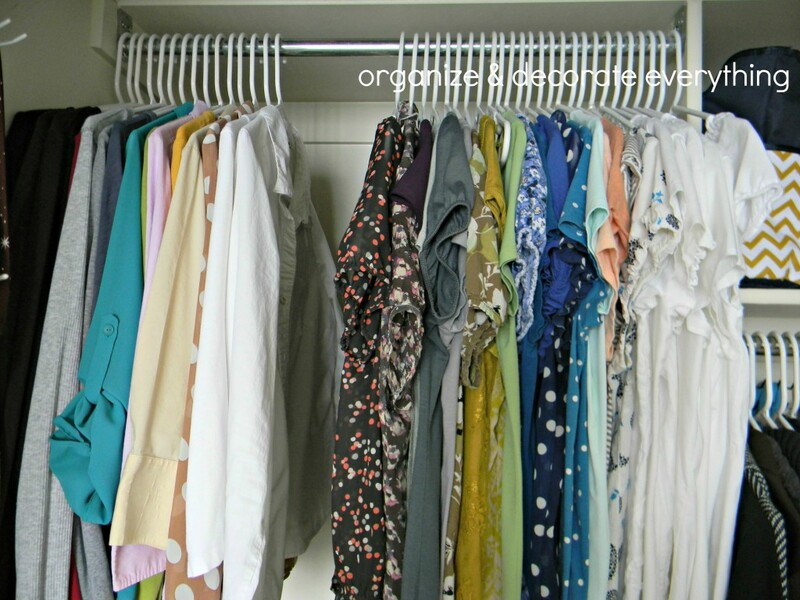 Use over-the-door organizers or hooks to hold things you use often. I have my exercise clothes, hats, and a jacket to grab quickly. 4- Don’t place things in your closet that don’t belong. 7- Don’t store things behind other things. Next week will be our Point of View Link Party. 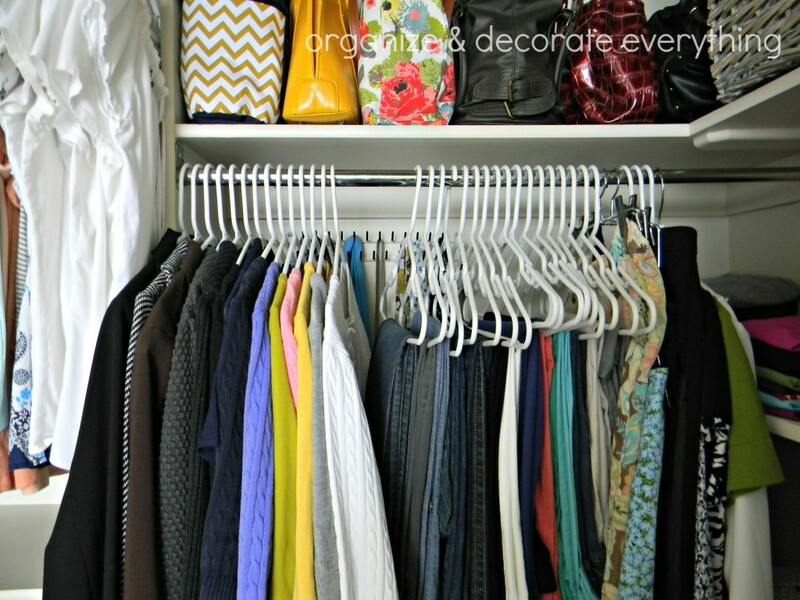 The theme is closets and we would love you to link up your organized, painted, repurposed, or anything else you can think of that has to do with closets. I think I read somewhere that we only wear about 20% of the clothes in our closet. If we actually choose to purge most of the clothes we don’t wear (and give to charity) that would free up a lot of closet space and make keeping it organized a lot easier. Love these ideas, especially the one about would I buy it now, and taking a picture of what it looks like all clean and organized. Thanks for sharing. 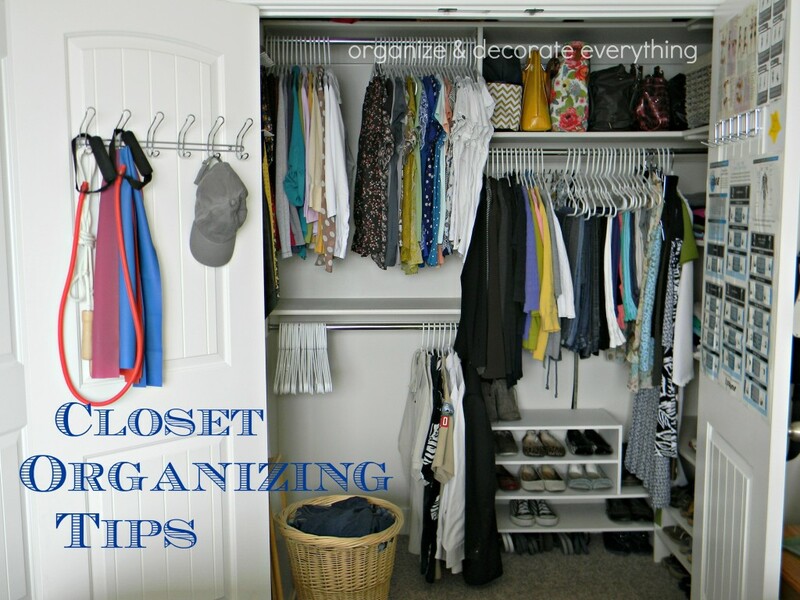 Your closet is definitely organized! I’m so jealous, Leanne. Love this!! Where did you buy your portable shelves? I’ve been looking for something just like that but can’t find them. Thanks!